Credit Suisse’s ability to survive in its present form is threatened by the latest revelations of past mismanagement and dysfunctional trading. Follow our Blog which will carry the latest updates as the drama unfolds. 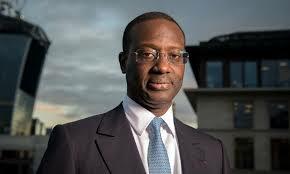 CS CEO Tidjane Thiam [image left] admitted in a video interview that the bank had followed a Pursuit of Revenue “At All Costs” policy which had facilitated traders secretly holding high risk illiquid positions. Losses may eventually run into billions of dollars. Updates here and here point to fractured internal communications. The bank’s capital ratio was already down to 11.4% – after the $6 billion capital raising. Those investors lost badly in the massive drop in CS’s share price. The bank can hardly expect further capital from that source. There is no buffer from credible uncertainties. The deflation cycle looks set in for a while and resource prices are heading down (again). China’s stock market is teetering (again) and The Street is confident a Chinese crash is imminent. ISIS want to explode a dirty nuclear bomb and some respected experts are only surprised it hasn’t already happened. Central banks are playing a dangerous game which has the probable outcome that deflation will morph into stagflation – for which there is no known remedy. To understand it, first read Matt Levine, then this, and this and this and then that and then this post. The upshot of this is that the bank’s official 11.4% capital adequacy may be an over-estimate. Perhaps the bank is already on the brink of a Liquidity Death Spiral. Note that about 40 percent of the bonds in the $1.4 trillion U.S. junk-debt market didn’t trade at all in the first two months of this year, and those that did were “absolutely crushed”. An estimated loss of only 10% on the $90 billion fire sale may be over-optimistic. Was It Pursuit of Revenue or Illegal Profit – “At All Costs”? Were they all caused by policies designed to protect corporate crime – through ingrained deliberate ignorance and wilful blindness? How is the bank going to reduce leverage in its global markets unit to $290 billion from $380 billion by the end of 2016? That’s $90 billion of assets that may be unloaded at fire-sale prices. If these positions are illiquid, which some of them seem to be, it could have a major impact on several markets. If you make money you’re a trader but if you don’t you’re a rogue trader. Credit Suisse plans to monitor employee behavior to catch rogue trading through Artificial Intelligence surveillance, see: Signac – a 50/50 partnership with AI firm Palantir Technologies Inc. KISS: Why not Read Your Mail? Considering that the bank ignored repeated warnings of rogue activity, is it naive to suggest that the bank should read its mail?